Enjoy the Majestic Smoky Mountains!!! The Choga Mountain Creek Cabin, located in Topton near Andrews North Carolina, comes with a guarantee. 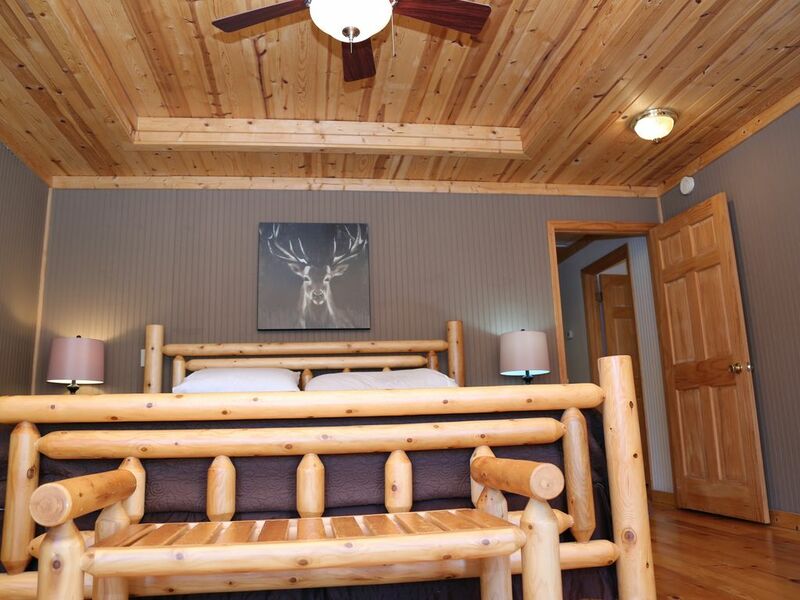 If you find a better price for a comparable cabin in the Smokies, we will beat your best price. You will find the comfort of 3 Bed/3 Bath, beautifully situated in the Smoky Mountains above Andrews, NC. It is the perfect mountain respite for your party (sleeps 8). Tucked away amidst the cool fresh mountain air, you can pass the time listening to the soothing sounds of nature and rushing water, enjoy hiking, fishing, boating, biking, rafting, swimming or exploring. You will feel at home the moment you arrive to the welcoming sight of an easily accessible driveway and parking area (4x4 not required), a large level grass yard and the perfect covered deck with a calming porch swing (note: garage is not available to renters). The inside will remind you of a rustic vacation cabin dream with more room than you imagined possible. Beautiful hardwood floors, wood ceilings and walls, surround you in a relaxing atmosphere with all new plush, leather furniture and ample seating. The main level consists of a living room, kitchen, master bedroom & bath, 2nd bedroom with adjoining guest bathroom, and a spacious sunroom/dining room and playroom equipped with toys for tots and a game table for teens and adults. Downstairs you will find a large family room, more leather sofas, a 56 inch big screen TV, movie/game library, laundry room, and 3rd bedroom with 2 sets of bunk beds and full bathroom. You'll find an outside entrance to a covered porch and beautiful screen room, as well as a back deck equipped with a gas grill. There is a winding creek running through the property partially fed by a small fresh water spring, perfect for drinking, playing or keeping beverages cool the old fashion way. The property is within walking distance to Lake Nanahala (about 1-2 miles), six miles from a public boat ramp, ten miles from Andrews where you will find the local grocery store, drug store, restaurants and more. When you have conquered the dragon's tail, tired from white water rafting, fly fishing the river, gem mining, riding some of the most beautiful mountain bike trails in North America, playing in the waterfalls, exploring the scenic hiking trails or a fun filled day at the Lake, you can retreat to the comforts of the Choga Mountain Creek Cabin recluse and gather your party around the outdoor fire pit and sit in awe at some of the most vivid astronomy you have ever seen. TV service, cable or pay per view are not available, however we do offer a nice collection of family movies and the use of a DVD, VHS player on a 57 inch big screen TV. There is a landline phone for your convenience. Local phone calls & local or toll free dial up modem internet are free. Long distance phone calls will be charged 40 cents per minute. There is no cell phone coverage on the mountain. Emergency Medical Treatment: we are several miles from the nearest hospital. If you have a medical emergency, there is a 911 emergency medical/ambulance discharge center within minutes of the cabin. Boating: Lake Nantahala is one of our favorite places to enjoy the spring, summer and fall. The water is clean and cool. You will find brochures in the cabin welcome binder for several different establishments that rent Pontoon or ski boats. We recommend “Lakes End” marina located on Wayah Rd. It is the closest and will get you out on the Lake in no time. Ask at the desk for a map of the lake and where you can tie up and enjoy the rope swings or hike to the waterfalls! Rafting: There are multiple adventure centers that can cater to your white water needs, brochures are located in the cabin welcome binder. The closest and best value rafting companies are Carolina Outfitters and Paddle Inn Rafting Company. Fishing: If you have little ones and want a guaranteed catch, there is a trout farm located about 10 miles from the cabin. Prices are reasonable, they provide poles, worms and will even gut and clean your trout for you. For the more adventuresome fisherman we recommend the river along Wayah Rd. The further you go the more beautiful the scenery becomes. Just stop along the way and pick a spot not already occupied along the river. You can also try down Ole River Road just off of Junaluska Rd. or contact the Nantahala Outdoor center for more suggestions. Hiking: Please enjoy the many trails and walking areas behind the house and up by the old church and cemetery. The old logging road behind the house will take you to Lake Nantahala. It is all family property and privately owned. We suggest taking a snack or light lunch and plenty of water. The little white church and cemetery on the hill across the street is fun to explore. Also a fun family play spot is located just a ¼ mile further down Lil Choga Rd. It is a small area where the creek runs over the road. Our little ones like to “hike” down to splash and play in the cold mountain water. Mountain Biking: Contact NOC for local maps and details on trails. Or check cabin welcome binder and NOC NC trail gide in cabin. Out to Eat: There is a new Pizza buffet/Pub with a nice soup and salad bar located by the Family Dollar Store just off Main St. in Andrews. If you want to spice it up a little, try Monte Albon. Their authentic Mexican cuisine is delicious! In addition, the quaint little local restaurants on Main Street are a must try. The Choga Creek Cabin is everything our busy metropolitan lifestyle is not – the perfect family get away. My large family and I love visiting Choga. We explore the miles and miles of private family trails, camp, hunt, wade in the streams and play on the lake rope swings, we enjoy the white water rafting, motorcycle and mountain bike trails, fishing, boating and relaxing to the soothing sounds of the fresh water spring behind the house. We vacation here in our spacious recluse as often as possible, but when we are not here, we are pleased to make our mountain get away available to renters seeking to leave worry, stress and the busy city behind for a season and escape to the carefree life in the mountains. The Choga Creek Cabin is beautifully situated in the Smoky Mountains above Andrews, but easily accessible. It is surrounded by hundreds of acres of family property where renters can access miles and miles of private hiking trails, fishing all within walking distance to the Lake Nanahala. We feel our cabin, with 3 bedrooms, 3 bathrooms and beds for 8, is one of the best value rentals on VRBO. It is clean and newly remodeled. Whether you are coming for the fresh mountain air, a hike through miles of private trails, fishing, white water rafting, swimming/boating at Lake Nanahala within a short walk from the cabin, or just relaxing to a book, video or board game from our small personal library and the soothing sound of the brook behind the house, we are confident the Choga Creek Cabin is perfect for your upcoming vacation. This was AWFUL!!!!!! Never. Ever. Rent Here!!!!! My friend and I (both single mothers)rented here with our (collectively) four kids. We were promised DVD player (we knew we were renting where cell service did not work) but were promised a land line, and basic stuff (like a fridge). The landline never worked. Ever (which was a problem in getting in touch with one another regarding arrival time) . Then the power went out for a couple of minutes knocked the DVD player out (they don't have cable) and apparently the fridge????? We spent a lot of time mopping up their floor. Cleaning fridge. After much complaining landlords offered us 25 dollars compensation (it was 600 to rent for two nights). They said "power outage not their fault"
Several storms in the area have hit us pretty hard this summer. Unfortunately, Mary stayed during one of those storms. The phone company and power company worked tirelessly for 2 weeks in the area repairing all the downed lines. Mary forgot to mention that when she arrived everything else was clean, working, and in good order. She enjoyed a great vacation but on her last night another storm took out the power for a few minutes and the surge fried the fridge. The surge also reset the appliances in the house and she didn't know how to switch inputs on the remote for the DVD player - but her kids got it to work. We did communicate multiple times both during and after her stay and tried to resolve the issues as best we could. While the weather is completely out of our control, we did offer Mary a free night on a return stay and reimbursed her for the ice cream that had melted. After several attempts to appease Mary she warned us that she'd leave us a 5 star review if we reimbursed her entire stay but threatened a bad review if we didn't. I guess we got the later. Note: All of the storm related issues have been repaired and upgraded and measures have been taken to prevent the surges/lines from going down in the future. This was a last minute trip for our group . The owners went outside their way to accommodate us on such a short notice. The cabin was very clean and well equipped and met all of our needs. The owners even called me on my way there to inform me they had stocked the freezer with ice for us. Any issues with the cabin were promptly taken care of. It was truly a great experience for a group of tired bikers. We all agree that we will use the cabin again for our future trips and will recommend this cabin to our friends. I am looking forward to my next trip. Great, did not want to leave. Beautiful cabin, very spacious and clean. Seating and beds very comfortable. Kids loved family room downstairs, even though no local TV or internet, it was stocked with family movies. It kept them entertained and happy. Nice gas grill. Wonderful fireplace with very comfortable furniture. Would definitely recommend to anyone and look forward to returning. My family and I stayed here for the solar eclipse. The house was clean and spacious. There were plenty of linens for all of us. My great-nephew enjoyed the box of trains. It was a perfect day and we encountered many friendly neighbors while walking. Our stay was short, but we enjoyed as much as we could in the area. Cabin is nice but it's got some deficiencies that require fixing. Very nice cabin, quite, cozy and clean. Property is located in the mountains above Andrews, NC. All local attractions or activities require driving or hiking between 10 to 20 miles. The lake is within a short 1 mile walk or 10 mile drive to the marina. The owners are not responsible for any accidents, injuries, or illness that occurs while on the premises or its facilities. The owners are not responsible for the loss of personal belongings or valuables of the guest. By accepting this reservation, it is agreed that all guests are expressly assuming the risk of any harm arising from their use of the premises and/or its belongings.